With the preponderance of mid-century modern furniture and furnishings dominating the design scene over the past few years, it would make sense that other trends from that era would else come back around. And while everyone was falling in love with quartz countertops and subway tile backsplashes, terrazzo has been rising from underfoot, today dressing some of the chicest countertops around. If you’re ready for something new in your kitchen, consider these pros and cons of terrazzo. 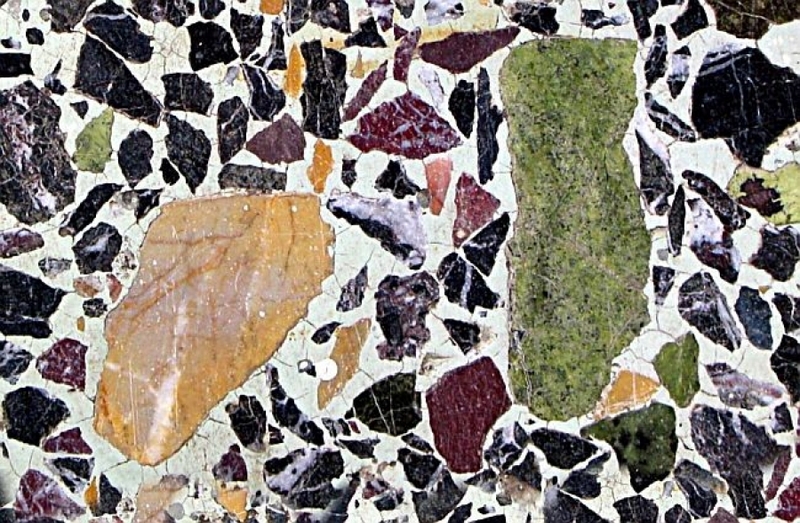 Another way terrazzo can look different is by trading out the cement that typically houses the chunks for resin. An advantage to using resin it that it’s not porous like cement, so it doesn’t need to be sealed, but it may end up being a more expensive process. You can’t go to Home Depot and order terrazzo the way you can quartz or granite. They may be more widely available someday, but, for now, you’ll have to visit a company who offers the product and works with qualified artisans – and the more experience they have, the better. You want to make sure the person creating your terrazzo is familiar with the product for the best results. The last thing you want is cracking or aggregate that doesn’t meet your expectations. If you’re turned off by the maintenance involved in caring for marble, you probably won’t be keen on taking care of terrazzo. While it’s extremely durable, terrazzo requires regular maintenance Without proper cleaning and sealing, they can become damaged, get scratched or have their color fade in certain spots.